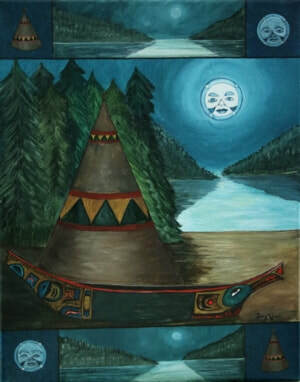 This painting is part of Ting Yuen’s First Nation Series. The moon is the symbol of the Guardian. Because the moon controls the tides and illuminates the night sky, it is also associated with transformation and is widely regarded as an important protector. Since the influence of the moon is so powerful, shamans often call upon it as a spirit guide.